IPR-10G-HDMI provides monitoring of HD SMPTE ST 2110 signals via HDMI and support for UltraHD up to 30p. It receives SMPTE ST 2110 over 10 GigE connectivity, formats the data for output on a full-size HDMI interface, and the associated audio from the video stream is extracted, synchronized, and embedded into the HDMI interface and also output on an analog RCA interface. IPR-10G-HDMI extracts a SMPTE ST 2110 essence from an incoming IP stream and presents it for display on HDMI devices. It's rugged, fanless, Mini-Converter design is ideal for placement in a wide range of display scenarios, from studios to field. The IPR-10G-HDMI is a SMPTE ST 2110 to HDMI Mini-Converter suited for point-of-use applications including source monitoring. The AJA IPR-10G-HDMI receives SMPTE ST 2110 IP video and audio, then formats the data for output on a full size HDMI 1.4b interface. IPR-10G-HDMI provides HDMI output from SMPTE ST 2110 video and audio over IP compatible devices. 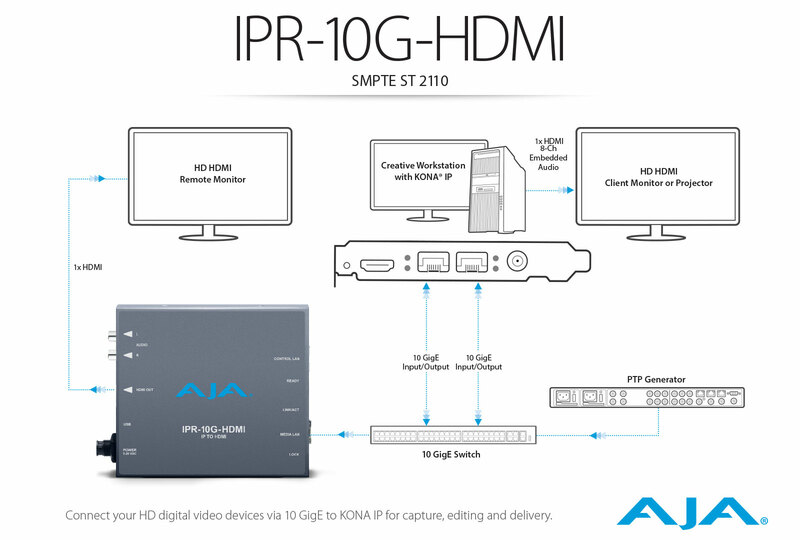 Combine your IPR-10G-HDMI units with AJA KONA IP (I/O card for use in desktop workstations) to instantly create a real-world ST 2110 workflow for video over IP production and monitoring. IPR-10G-HDMI provides two key methods for control. The Control LAN Ethernet port enables control of the Mini-Converter from web browsers on any platform and REST clients. The mini-USB connector facilitates quick and simple initial network configuration, and firmware updates.